Sortimo has announced their new LS-Boxx, which is identical in size to their medium L-Boxx's, but instead has an opening in the front for removable trays. These trays, called i-Boxx's comes in two sizes and come with insert boxes and feature a transparent lid. 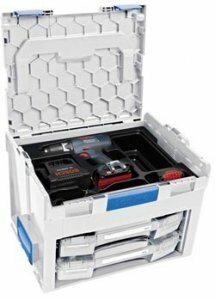 The top portion of the LS-Boxx opens just like a regular L-Boxx and can house small tools such as cordless drills. The advantage of this new box is its ability to carry a tool in the top, and all the accessories needed in the tray's below. Sortimo talks about different tray options for the new LS-Boxx, but so far I can only find this one photo. These LS-Boxx's are compatible with existing L-Boxx containers, as well as other Sortimo vehicle storage solutions. Sortimo is based in Germany, and Sortimo U.S. doesn't expect the LS-Boxx to hit our shelves until sometime next year. I wonder if Bosch will start using these? Also new for Sortimo are powered L-Boxx. These new boxes are called L-BOXXes, and offer a portable power solution that all ties in with Sortimo's modular system. They have two current options available, 230V and 400V, and also available are matching power distribution cables. Again these are only available in parts of Europe at this time, but I will keep my eye out of the US crowd.